Today, the design competition space has advanced in two distinct paths. Firstly, there are free competitions where young designers try to demonstrate their skills and aim for earning prizes, and secondly there are the professional design competitions and awards that offer fame and publicity to participants. Considering 466 design competitions within the designcompetition.com database, almost two thirds of all competitions said they are free competitions. However, there is no such thing as a free competition, as when we also consider the previously done survey, designers do indeed spend significant time on competitions. The average cost to join table has a sample size of 81 design competitions which answered the questions, it is seen that a professional design competition costs on average 130 euros for joining it when early, late and standard costs are accounted for. 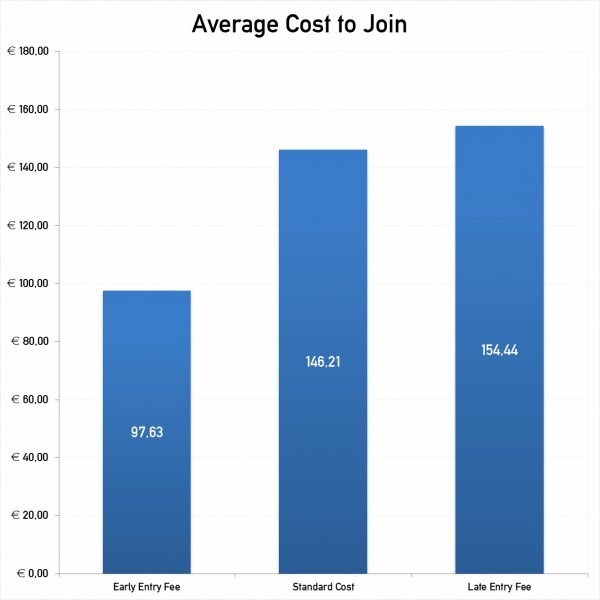 These costs do not include the participants' time investment either. 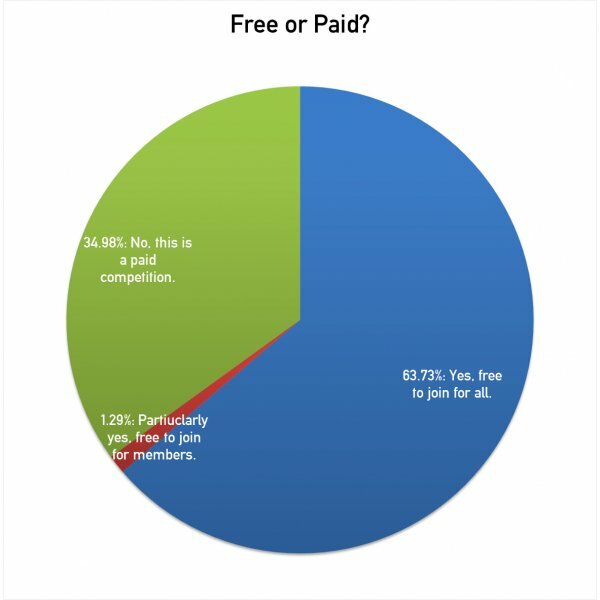 The average further fees table demonstrates the amount of extra money requested from winners. It is seen that the Gala-Night and PR campaign fees are the highest. 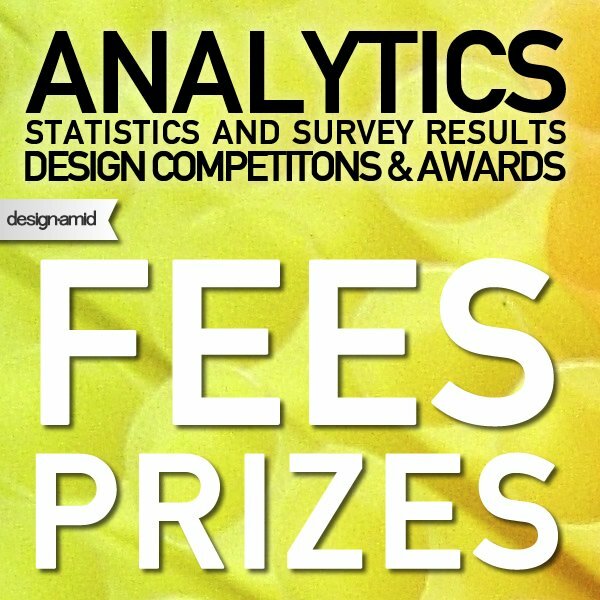 The Total Fees in this graph is the average a designer has to pay after winning the award. 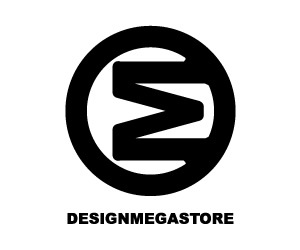 Compare it to A' Design Awards, where there are no further fees. 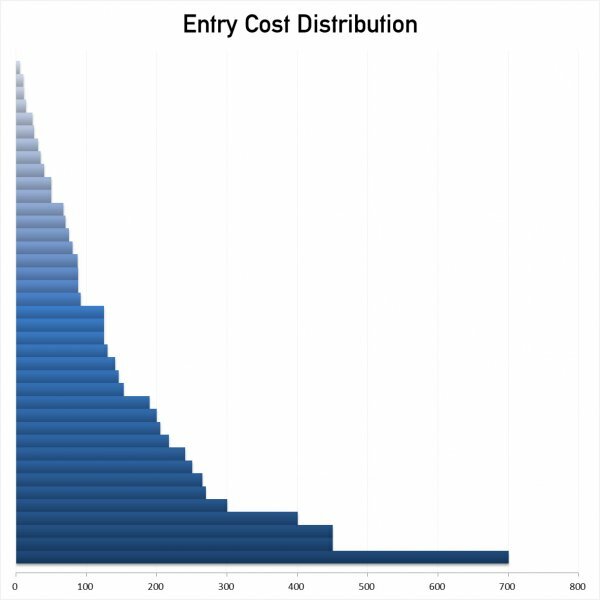 The entry cost distribution table helps us to understand the entry fees for each competition. The top bars are usually the most prestigious competitions such as Red Dot, If Design Award or A' Design Award and Competition. Meanwhile, the lowest bars are usually for photography contests where participants make dozens of submissions. 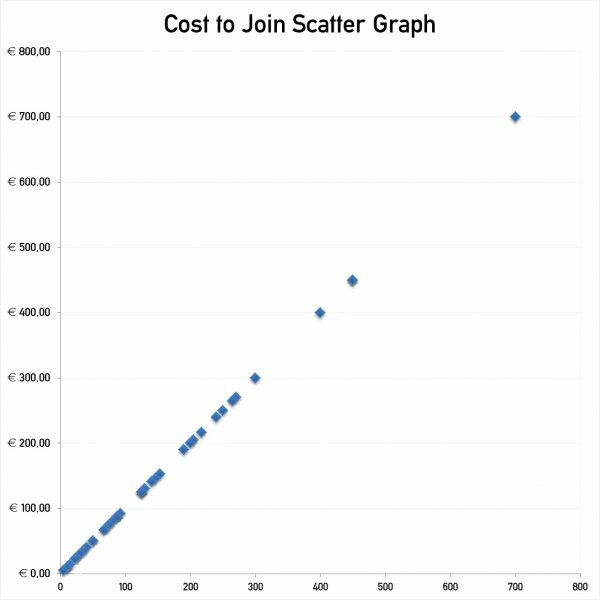 Again in the Cost to Join Scatter Graph for Design Competitions, we could see that the majority of competitions costs 300 Euros or less to join. Again, the time involvement is not included; if we were to include the time requirement, the line would have become flatter; i.e. the difference between cheap and expensive competitions is almost reaches to zero as a project becomes more complex. 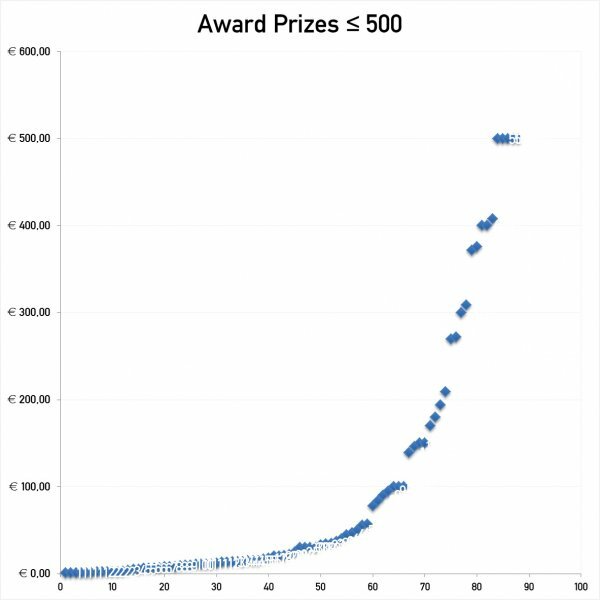 This is the average prize of 269 design competitions that offered monetary compensation to winners. It is indeed a good sum when we consider the total amount of money that could be earned, yet again, considering the number of entries, it is a very small sum; each competition honors around a dozen designers, among hundreds entries, making the prizes less than 5 euro per entry. 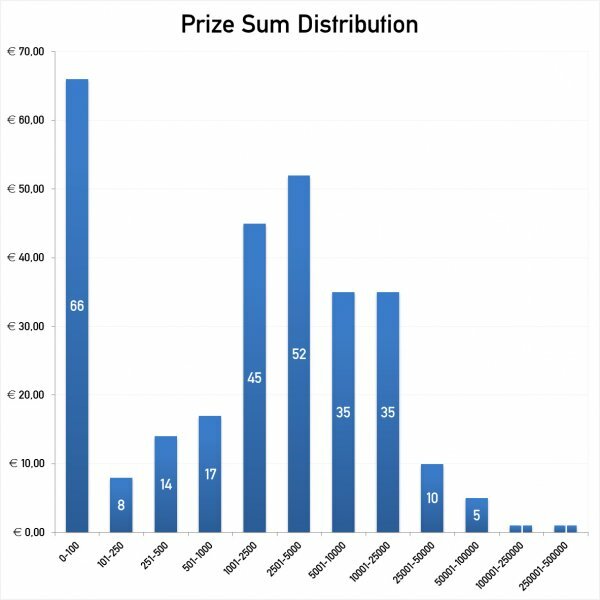 This graph shows the distribution of award prizes that is less than 500 euros. 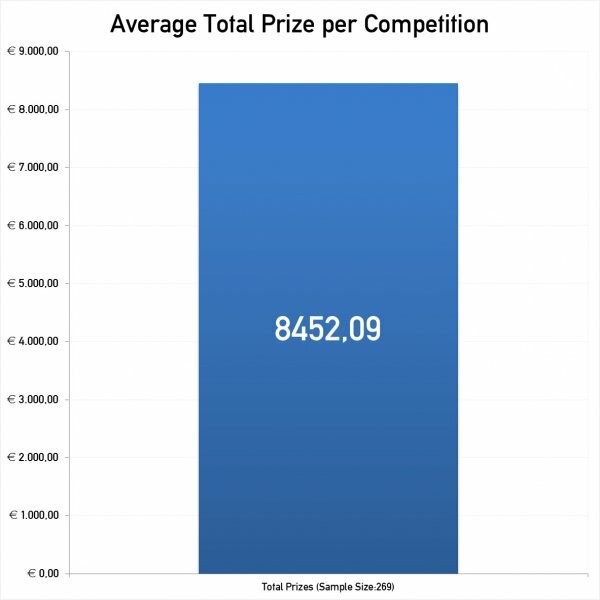 Most of the competitions have an award sum less than 100 euros, and only a few offer more. It is interesting that organizers choose rounded numbers as prizes such as 100, 200, 300, 400 or 500. My personal opinion is that any competition that offers less than 500 award prize is not a good time investment. These are usually small design contests organized by small companies. 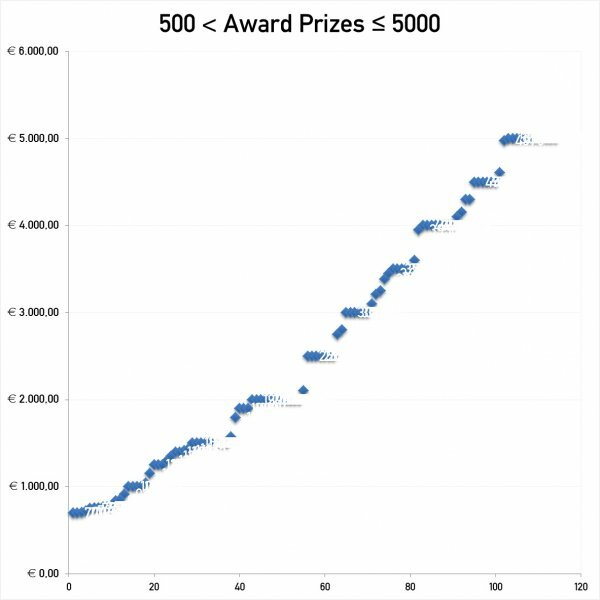 This graph shows the award prize distribution between 500 and 5000 euros. These are the median competitions; joining them is again not a good time investment, however they could contribute to the portfolio and provide slight returns of prestige. Competitions in this range start offering winners services and benefits. These are usually organized by education institutions. 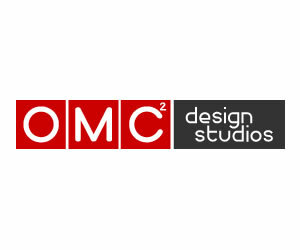 These are premium design competitions, usually organized by governments, or events that are funded by government level initiatives, a very few are organized by very large companies. It makes sense to join these competitions as winners and participants are usually offered a lot benefits such as yearbook inclusion, award prize, exhibition etc. 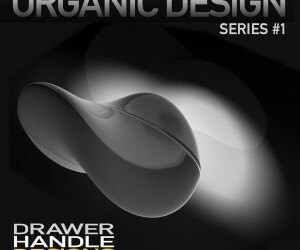 They could be compared to winning an international famous design award. 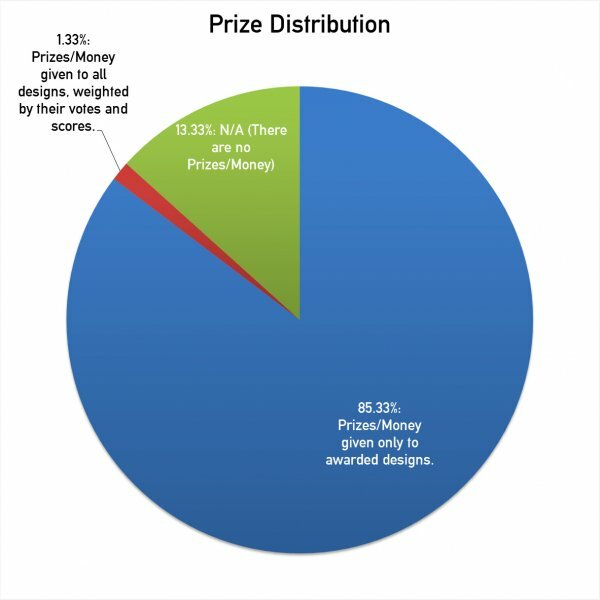 This graph shows how the money is distributed within a design competition or contest. 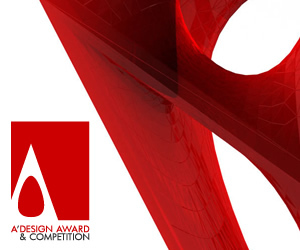 Design awards and some competitions do not offer any prize. 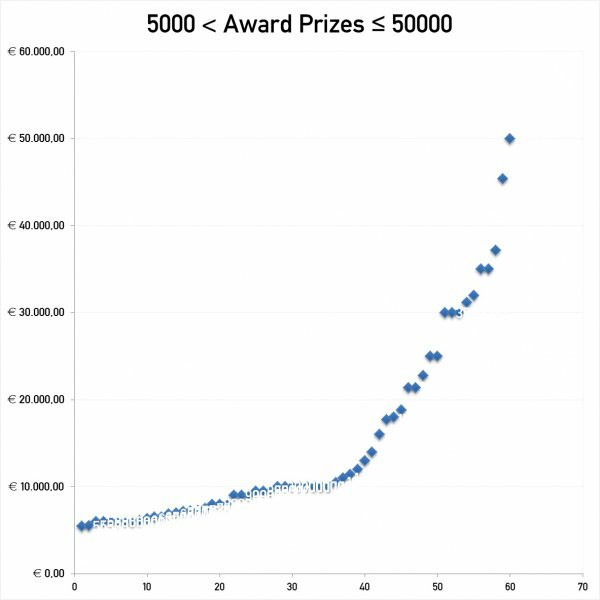 Regular competitions offer money to winners only, and a percentage of competitions distribute the prizes equally to all participants; these are the new types of crowdsourcing competitions. 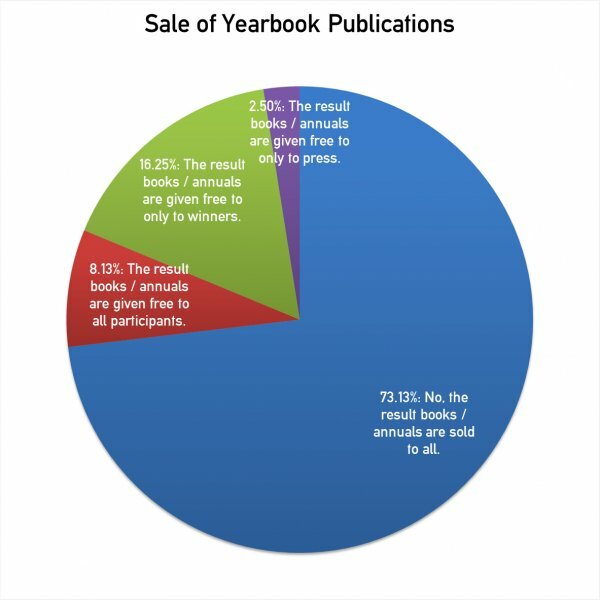 This graph shows whether yearbooks are sold or given free to winners. It must be noted most competitions do not even feature a yearbook. Only a quarter of design competitions give free books to winners and participants while others will not sell it at all. It is strange that 2.5 percent of competitions do provide books to press only. This article was added on Monday, 27th of January, 2014 at 05.32 am by author Onur Cobanli Tags: design competition fees, design competition prize, design competition participation costs. Read our copyright policy here.